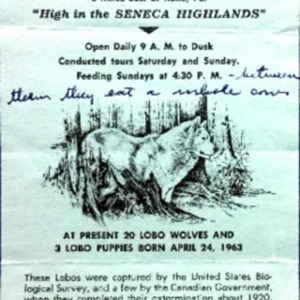 This leaflet (one half-page) is an advertisement for the lobo wolf park. It includes the location; hours of operation, tours, and feeding; the number of wolves; and the wolves' history. Full text of the leaflet is quoted below. This leaflet has some handwritten notes on the front and back, which are transcribed in bold in the full text. This leaflet was published before 1977 without a copyright notice, so it is in the public domain. 5 Miles East of Kane, Pa.
"High in the SENECA HIGHLANDS"
Conducted tours Saturday and Sunday. These Lobos were captured by the United States Biological Survey, and a few by the Canadian Government, when they completed their extermination about 1920. They are the same wolves which previous to 1920 ranged the plains of the Rocky Mountains, killing cattle and occasionally horses, selecting the fattest and best, and when they met they frequently killed each other, and were so intolerable that the United States and Canada cooperated in a war of extermination, which is long since completed, there being none in zoos or in the wild. These wolves, located in a beautiful woodland setting in virgin forest, are truly the only lobo wolves in the world. They also have one Timber Wolf - a Coyote - and a 3 mos. old Panther. They had 3 foxes but they dug their way out under the fence - one of them came back for food and then left again!